At the start of the game there will be some balls moving around. When you click at the screen, an explosion will occur at the point you clicked. When the explosion touches other balls, the balls will explode, which in turn will explode other balls in a chain reaction. 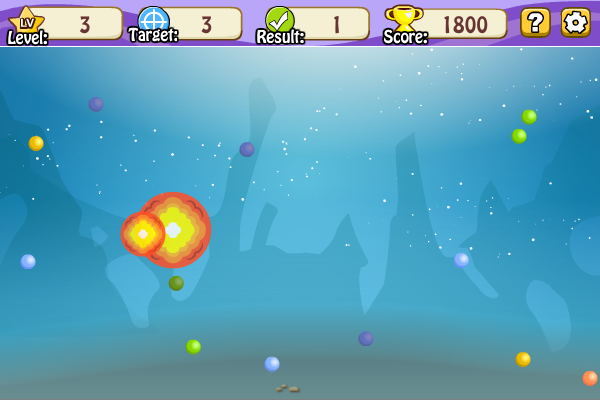 Since you can click only once and the explosion will stay on the screen for only a short while, you need to plan your click carefully to try to explode as many balls as possible. If you reach the target balls to explode for a level, you will then be promoted to the next level, otherwise you lose the game and the game is over. As the game progresses, there will be more and more balls and it will be harder and harder to reach the target. Chain Reaction is a game that works under windows xp, windows vista and windows 7. It supports both 32-bit & 64-bit windows editions, therefore it could run faster on 64-bit computers. It is Free so you can download it and share it with your friends. Estimated download time for Chain Reaction on a common adsl connection is less than a minute. Version 1.0.0 was released one thousand eight hundred sixty nine days ago by Novel Games Limited. Click the green download button to download it now.